Turning the clock back nearly 30 years, we look at issue 4 of the Chelsea Independent, the fanzine of the Chelsea Independent Supporters Association (CISA). Issue 4 came out in Dec 1988 when Chelsea were not so good and I was not so fat. In the season 1988/89 the CISA team consisted of Chair Editor – Mick Alpress, Secretary – Pete Collins, Treasurer – Mike Ticher, Membership Secretary – Mike Brown and the Design and Layout was credited to Steev Burgess. The price? Just 20 new pence. Reading the editorial by Mick Allpress the sales of this “photocopied pamphlet” (words used by Ken Bates to describe the Independent) had exceeded 2,500 copies which was exactly 2,000 more than the first issue. (Which I will be reviewing soon.) John Hollins was in charge of the Blues and it was suggested by Mick that he should use the two substitutes tactically and not exclusively during the last 5 minutes of the 90. Although it was still pre Xmas there were already “Hollins must go” chants with in certain sections of the Chelsea support. However the Editor was still optimistic after a narrow defeat at Anfield where only John Aldridge conning the ref, prevented Chelsea gaining a draw. The next page was titled Headcase and featured that bastion of fair play Jimmy Case. Case was playing for Southampton at this time and had laid into everything that moved during the match and everything that didn’t move including Darren Wood in this instance. One of the features in this issue was Chelsea’s Lowest Appearance Makers. This was number 2 of the series and featured Tony Potrac. Tony was Australian and his big moment came in 1972 when played against Huddersfield. However Tony lost his place the very next week to a certain Alan Hudson. Page six is dedicated to F.A.N (Football’s Alternative Network). This was a list of the fan’s alternative to the match day programme or match day magazine to you youngsters. How many of these are still up and running? The following ones are/were related to various clubs. Whilst some are obvious some a little less obvious. Can remember which fanzine is associated to which club? The Celery Patch was the title of the Independent’s letters page. Topics included the price of Chelsea’s membership scheme, which apparently was not as good as Leicester’s which was priced at £2 and praise from a Tottenham fan who thought that the CISA was “thoroughly commendable exercise”. Save the Bridge was a hot topic as well. Some great fund raising ideas from a Paul Bradbury from Surrey who suggested interest free loans from supporters who get a season ticket in return and another idea that involves sponsoring Ken Bates to shave his beard off. Paul Condom wrote in with his concern that the Chelsea kits are being changed too regularly. I wonder what the guy thinks now with 3 new ones on the horizon? Tim Sugden from Camberwell was concerned about the left back position and Brian Walker from Greenwich was concerned that Darren Wood had become the “whipping boy” since the departure of Keith Dublin who left to join former Blue Doug Rougvie at Brighton who at the time was nicknamed by many Blues as “Chelsea on Sea”. The next article wrote by Daryl Mechem and was titled Tomorrow’s Chelsea. Many young Chelsea youth team products although getting into Chelsea’s first team were not establishing themselves as Tomorrow Chelsea as the self titled feature in the match day programme suggested. Daryl went so far as to suggest that the stars of the Chelsea youth setup were in fact Today’s Brighton, Today’s Orient, Today’s Brentford and Today’s Brentford. All Quiet on New Years Day talks about the Luton Town membership scheme. The previous season, although banned, around 800 Chelsea fans ( me included) got into Kenilworth Road and even managed to taunt Foster by reminding him of his tears at Wembley. Alas McNaught pays tribute to John McNaught as he leaves the Blues to play out his days in his native Scotland. Paranoia highlights that although the CISA had paid the full asking price to sponsor John Coady’s kit the club decided to omit the CISA’s phone number and later the group’s name in full. The reason given was that the group was seen as “a direct competitor to Chelsea Football Club”. Another issue of the time concerned the sale of away match tickets. At this time the match programme was reporting that some of the away games were “strictly all ticket”. This was not the case in all but three fixtures. In fact it’s noted that there was usually more turnstiles open for cash entry than there was for ticket holders at most venues. Bill McComish paid tribute to Mickey Hazard in an article called A Mickey-Take. Mickey was one of the flair players of the time but used to spend an extraordinary amount of time keeping the subs bench warm. Simod Says looks at the importance of the Simod Cup. Basically it wasn’t important. 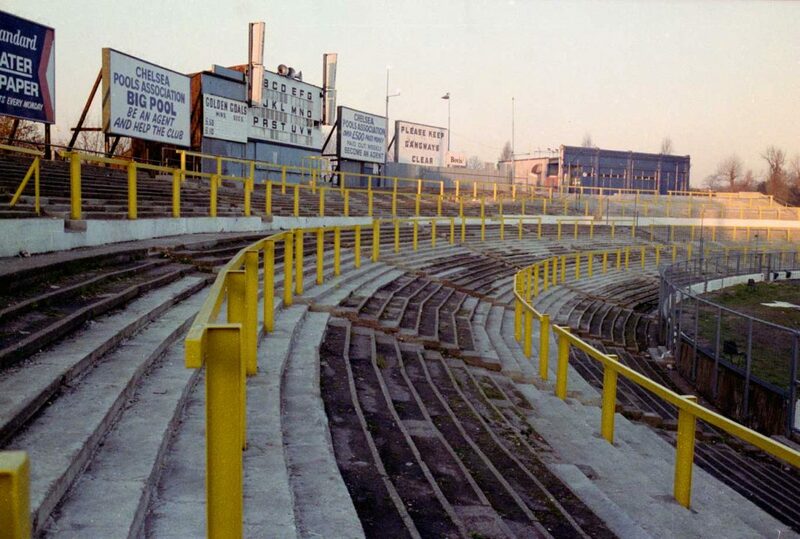 The Top Tier Club was “dedicated to footballers who, in their services to the art of football, have gone beyond the call of duty – and hoofed the ball into the third tier of the East Stand”. In 1988 the running total stood at an impressive total of 4. They were Micky Droy, Neville Southall, Keith Dublin and Eddie Niedzwiecki. Finally on the back cover of this issue there was a Christmas quiz. Below are the questions see how many you can answer. What was the attendance at the Boxing Day 1976 match, and what was so significant about it? Who was innocent on QPR’s pitch in 1981? Who missed penalties in consecutive matches against Portsmouth and Brighton in 1986? On Christmas Day 1957 who did Chelsea play and what was the score? One of Chelsea’s greatest forwards made his debut on Boxing Day 1980 who was he?